"Violence," he said, "has to do with human beings, not property." During the height of US atomic interests, the Northeast Utilities Company (NU) began to consider building a nuclear power plant in the small depressed town of Montague, Massachusetts. With the promised investment of 1.52 billion dollars in the area - an amount which represented about thirty times the entire assessed value of the town - NU was promising more jobs and business than the town had ever seen. Opposition was looking small and weak with only a number of local organic farmers organized together who called themselves Nuclear Objectors for a Pure Environment (NOPE). 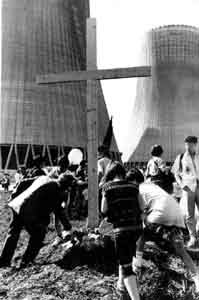 That was until the George Washington's Birthday, 1974 when Sam Lovejoy sparked the anti-nuclear movement in the United States through one lone act of civil disobedience. This is Sam's story as told by Harvey Wasserman at the time in a magazine called Win. Using a few simple farm tools [to loosen the turnbuckles in the stays of the tower], Lovejoy left behind him 349 feet of twisted wreckage. He then ran to the nearest road, flagged down a passing patrol car, and got a ride to the Turners Falls station, where he gave Officer Donald Cade the good news. "As a farmer concerned about the organic and the natural," he said in a typed four-page statement, "I find irradiated fruit, vegetables and meat to be inorganic; and I can find no natural balance with a nuclear plant in this or any community. "There seems to be no way for our children to be born or raised safely in our community in the very near future. No children? No edible food? What will there be? "While my purpose is not to provoke fear, I believe that we must act; positive action is the only option left open to us. Communities have the same rights as individuals. We must seize back control of our own community. "The nuclear energy industry and its support elements in government are practicing actively a form of despotism. They have selected the less populated rural countryside to answer the energy needs of the cities. While not denying the urban need for electrical energy (perhaps addiction is more appropriate), why cannot reactors be built near those they are intended to serve? Is it not more efficient? Or are we witnessing a corrupt balance between population and risk? "It is my firm conviction that if a jury of twelve impartial scientists was empanelled, and following normal legal procedure they were given all pertinent data and arguments, then this jury would never give a unanimous vote for deployment of nuclear reactors amongst the civilian population. Rather, I believe they would call for the complete shutdown of all the commercially operated nuclear plants. "Through positive action and a sense of moral outrage, I seek to test my convictions." A long-time resident of the town and the Valley, Sam was freed that morning on personal recognizance. Later he was indicted on one count of wanton and malicious destruction of personal property, which carried a possible five-year sentence. He pleaded "absolutely not guilty" and announced he would handle his own defense. The trial would begin in six months. Response from the local community was outrage. The Greenfield Recorder ran a rare front-page editorial denouncing the act, and one of its columnists compared Lovejoy to John Wilkes Booth, Sirhan Sirhan, Lee Harvey Oswald, and Adolph Hitler. A local selectman wondered (in print) how Sam would like it if someone burned down his barn. Another reiterated his belief that those opposed to the plant should leave town. But the opposition was ecstatic. Letters of support poured in, typically voicing the sentiment "I was truly inspired!" In general, the toppling of the tower forced the people of Montague and the Valley to realize that the power plant was a real issue, with more at stake than a scientific point of debate. For many it was the first realization that the plants were even planned. In the spring, town meetings in neighboring Shutesbury, Leverett, and Wendell went on record against the plant, while the Amherst town meeting narrowly defeated a broad resolution calling for a nuclear moratorium. Town elections are usually held before the town meeting, but this year, for the political purposes of one selectman, they came afterwards. Included on the ballot was the referendum proposition: "Should two nuclear plants be built in Montague?" The proposition was put there by pronuclear officials who expected to win by a landslide. Indeed, nearly everyone in town predicted the issue would pass by an eight to one or ten to one ratio. One selectman predicted twenty to one. To help focus the opposition, NOPE expanded to create the No Party, and entered a slate of five candidates-Anna Gyorgy for select- person, Janice Frey for board of health, Marc Sills for moderator, and Lovejoy and Nina Simon for town meeting representatives from the Montague Center precinct. Montague hadn't experienced much resembling radical politics since Shays' Rebellion, and the campaign got good press. Towns- people proved to be far less sold on the plant than had been believed. In a classic case of small-town paranoia, a family in one house would admit to being against the plant, but confess they were-afraid to discuss it with their neighbors because they thought everyone was for it. Then their neighbors would admit the same thing. The campaign quickly transcended the nuke issue and offered the nuclear opponents their first real opportunity to communicate with townspeople on an individual basis. The election results were also gratifying. The referendum passed, but the margin was less than 3 to 1. That may sound like a backhanded victory, but the fact that 770 of the 3000 voters registered solid opposition to a $ 1.52 billion project at such an early stage was no less than amazing. In addition, the NO candidates for town office carried more than 6 percent of the vote. But what blew the town's mind, most of all, was that Sam Lovejoy got more than a hundred votes for town meeting member in the first precinct. Some people, it seemed, thought toppling weather towers was not such a bad thing. SAM'S TOWER-TOPPLING got national attention, but its most important effect was on the immediate area where "nuke" suddenly became a household word. By early spring an area-wide organization called the Alternative Energy Coalition (AEC) began a successful campaign to put a dual referendum on the state Senate District ballot, a district roughly corresponding to the Radiation Hazard Zone of the proposed plant. The first proposition asked that the state senator be directed to oppose the Montague plant. The second asked that he be directed to "sponsor and support a resolution aimed at closing and dismantling" two active nuclear power plants at Rowe, Massachusetts, and Vernon, Vermont. By the end of the summer the AEC had gathered more than 3800 signatures, and the two questions were on the ballot. Area newspapers were beginning to fill with stories about atomic energy, and local car bumpers began to sprout a crop of blue-and-white stickers that said "No Nukes" and bore a circle with two wavy lines inside, the astrological sign of Aquarius. The symbol, said organizers, was for natural energy. In early September, all eyes turned to the Franklin County Superior Court in Greenfield. Lovejoy wanted his trial to become a public forum on nuclear power, and it proved to be just that, from the open "Hear-ye! to the closing "Not guilty!" At two pretrial hearings, Judge Kent Smith refused to accept that Lovejoy intended to defend himself. Confronted with a five-year felony charge, Lovejoy to the judge, he considered the toppling of the tower-and the trial-a political event, and that his defending himself was inseparable from the politics of the act. Smith, known as the most liberal judge on the Massachusetts circuit, conceded Lovejoy's right to act without counsel, but practi- cally pleaded with him not to do it. Lovejoy held fast, but agreed to use a lawyer when it came to take the stand himself. Under Massachusetts law, Lovejoy would have had to ask himself questions, then answer them. In pretrial motions Lovejoy asked for subpoena powers for any and all Northeast Utilities, state, or prosecution files on himself, other nuclear objectors, and on the health and safety of nuclear power plants. Smith denied the requests, but did grant Lovejoy's "motion to view," which meant that as soon as the jury was chosen it would be bused (at Lovejoy's expense) to the site of the tower. After lunch, Judge Smith, defendant Lovejoy, and prosecutor John Murphy piled into Smith's huge black Buick; the fourteen jurors and the court attendants took seats on a public bus. Followed by a caravan of spectators, all went off to view the tower. NU had flown in a replacement tower from Texas and erected it within two weeks after Lovejoy toppled the original, so all was pretty much as it had been February 22-with some notable exceptions. For one thing, to protect the turnbuckle stations, NU had installed eight-foot storm fences topped by two-way barbed wire. Signs warned would-be topplers that the stations were surrounded by an under- ground alarm system. And the turnbuckles themselves were now sheathed in quarter-inch steel. Both Lovejoy and prosecutor Murphy took pains to explain that all this hardware was not present at the time of the deed. The sun shone brightly, the sky was a deep blue, and everyone seemed to enjoy being out on an idyllic New England fall day. The only note of discord was sounded when Lovejoy attempted to describe the fragile ecology of the Montague Plains. The prosecution objected, and was sustained. Back in court, prosecutor Murphy presented testimony from three NU officials and three Montague police officers, establishing beyond a doubt that the tower had been toppled, that it was worth $42,500, and that Lovejoy did it. The boredom was relieved only by the unexpected and verv dramatic reading of Lovejoy's statement by Officer Donald Cade, the man on duty when Lovejoy turned himself in. Lovejoy, however, had some fireworks ready. The charge was "willful and malicious destruction of personal property," and the core of his defense was that the act was anything but malicious, that, in fact, it was motivated by none but the highest of motives-defense of the community. To prove his case, Lovejoy summoned Dr. John Gofman, author of Poisoned Power. Lovejoy asked Gofman to tell the jury his name, address, and occupation. Lovejoy then asked Gofman to define "nuclide," where- upon Murphy stood up to object and Smith ordered the jury out of the room. Smith asked Lovejoy to demonstrate the relevance of Gofman's testimony. Lovejoy responded that malice had not been proved by the Commonwealth and that he intended to show his motives. Gofman was the ablest person he could find to explain the dangers of nuclear power. Smith responded that only testimony relating to Lovejoy's actual state of mind at the time of the deed would be admissible. Had he talked to Gofman before February 22? "No, your Honor, but I read his book," Lovejoy responded. "But did you talk with him?" "Your Honor, I believe as sure as I'm standing here that when you read someone's book, you talk to them. I believe I talked to Geokge Washington, and the signers of the Constitution and Henry David Thoreau. Don't you talk to Oliver Wendell Holmes when you read his books?" Smith was impressed, but not swayed. He called a short recess and returned with a unique and somewhat bizarre ruling. Gofman could testify to the record, but not to the jury. If Lovejoy were found guilty, the case would go to the State Supreme Judicial Court before sentencing to determine the validity of the testimony. So while the jurors played pinochle in the back room, Gofman delivered a scathing indictment of the nuclear power industry. Under Lovejoy's questioning he told the court that he had worked on the Manhattan Project and with Glenn Seaborg, a chairman of the Atomic Energy Commission. The AEC's lax standards on low-level radia- tion, he said, were a "license to commit murder." As many as thirty-two thousand additional cases of cancer, leukemia and birth defects would result if nuclear development continued under such standards. "I don't really know whether the chance is one in ten, or one in a hundred, or one in ten thousand. I just ask myself in view of the fact that we have so much easier ways to generate energy needs, why do it this way?" The brunt of Gofman's testimony centered on plutonium, on which he had done much pioneer research. Gofman told the court that, in the Atomic Energy Commission's phrase, plutonium is "the most fiend- ishIy toxic substance ever known." Three tablespoonfuls, he said, could cause nine billion human cancers. But each nuclear plant creates thousands of pounds of waste plutonium, and there's no way to store it. "The proliferation of nuclear power carries with it the obligation to guard the radioactive garbage . . .not only for our generation but for the next thousand or several thousand." Gofman said plutonium has a half-life of 24,000 years and must be guarded "99.9999 percent perfectly, in peace and war, with human error and human malice, guerilla activities, psychotics, malfunction of equipment....Do you believe there's anything you'd like to guarantee will be done 99.9999 percent perfectly for 100,000 years?" Gofman capped his testimony with a conspiracy charge. "Some awfully big interests invested in uranium and the future of atomic power," he said. "And unfortunately their view is `We've got to recover our investment, no matter what the cost to the public." The scholarly, bearded Gofman cut a striking figure on the stand, and his testimony had enormous impact on the local community. A reporter for the Greenfield Recorder later wrote a column admitting that Gofman's testimony had convinced him to rethink his stand on nuclear power. Lovejoy's next witness was radical historian Howard Zinn, an expert on civil disobedience and an honored veteran of antiwar and antidraft cases. After Zinn's credentials had been established, Love joy asked him whether he thought the tower-toppling had been malicious. "No," Zinn blurted out ingenuously. Even as prosecutor Murphy was leaping to his feet, the jurors began gathering their wraps. Smith then let Zinn testify as Gofman had, without the jury present. Under questioning from Lovejoy, Zinn told the court that the tower- toppling was in the best tradition of Gandhi, Thoreau, and the Abolitionists, including (of course) Elijah P. Lovejoy, Sam's distant cousin, who was hanged by a proslavery mob in southern Illinois. Judge Smith interrupted to ask if true civil disobedience didn't demand both strict nonviolence and the acceptance of lawful punishment. Zinn replied that the destruction of property was not violent when life was at stake. "Violence," he said, "has to do with human beings, not property." Zinn pointed out that Lovejoy had turned himself in, whereas many civil disobedients disappear rather than stand trial. Smith, who was looking and acting more like Spencer Tracy every day, seemed much taken with Zinn, and constantly interrupted him with questions. A good third of what Zinn said was in the form of colloquy with the judge. At one point Smith asked leave for a private conversation with the witness, and leaned over to talk quietly. Zinn said later the judge had asked to meet him for dinner sometime. When Zinn finished, Lovejoy called a few character witnesses, as well as one Bruce Olmstead, an "environmental engineer." He testified that NU had sold him the wrecked tower for $250 and that he had used it to make three windmills. Finally, Lovejoy took the stand himself. The jury of nine women and five men, freed at last from their backroom confinement, were all ears. Northampton attorney Thomas Lesser did the questioning. Lovejoy began by talking about growing up as an army brat, then, after his father was killed, living on a farm near Springfield. There, he said, an old Yankee farmer taught him to respect the balance of nature. In high school he studied math and physics, but dropped out of Amherst College to work in the Springfield area. Returning to Amherst, he was graduated in political science, and then had moved to Montague Farm. His mind was made up about nuclear power during a trip to Seattle. There he read in local papers of a massive leak of radioactive wastes from a storage tank at Hanford, in eastern Washington state. More than one hundred thousand gallons had escaped from holding tanks into the ground. The incident had been concealed by the AEC and Atlantic-Richfield until some investigative reporters found out about it. When the story was printed, the AEC had a comeback. A computer printout, they said, showed that the liquid wouldn't reach the Columbia River (thus destroying it) before the year DD 2700. Until then, the Commission said confidently, everything would be fine. That, said Lovejoy, was it. For six months he read everything he could get his hands on about atomic energy, finally settling on Poisoned Power as the basic text. The more he read, Lovejoy told the jury, the more he was convinced nuclear power plants were "the most horrendous development our community has ever faced." And the more he looked into legal recourse, the more the AEC seemed like "a kangaroo court. . . a panel that acts as promoter and regulator, judge, jury, and thief all rolled into one." Returning to Montague, he saw the tower for the first time, and knew it would have to go down. He wasn't sure he'd be the one to do it, he said, but the tower definitely had to go. Lovejoy talked to the jury for six hours about his life and conversion to sabotage, without objection from the prosecution. The last hour was an intensely emotional narration of his final decision to topple the tower, how he acted not out of malice "but because I had fallen in love with a little four-year-old girl named Sequoyah. I asked myself, who am I to do this thing, to take on the role of judge. But then I thought about this little girl who couldn't defend herself, and I knew I had to act." After the trial several jurors said they were deeply moved by Lovejoy's testimony. A poll indicated a hung jury, at least eight to four or nine to three in Lovejoy's favor. Much would have depended on Judge Smith's directions, which might have been favorable on the malice question. But it never got that far. There was another aspect to the indictment, and it read "destruction of personal property." Under Massachusetts law, destroying personal property is a felony punishable by five years in prison; destroying real property is a six month misdemeanor. The prosecution wanted Sam behind bars for five years, not just six months. Smith had expressed doubt all along that the tower could pass as personal property. It was worth $42,500, nobody disputed that. But when Lovejoy produced two Montague tax officials who testified the tower had been assessed as real property, and when Murphy called an NU official who affirmed under cross-examination that the tax had been paid as real property, everyone knew it was all over. So, after lunch on Yom Kippur Eve, Smith convened court, again with the jury sent out, and announced his decision. He was going to void the charge because he "could not in good conscience ask a jury to deliberate on an indictment with a hole in it." Lovejoy practically begged him not to do it. He had meant the trial to test the issue of nuclear power, and he wanted his guilt or innocence to be determined on that issue, by the jury and "the people of Franklin County." Smith replied with a lecture on the law. "Justice is justice is justice is justice," he concluded. Then he called in the jury, ordered them to stand and render a verdict of "Not guilty." He then dismissed the court. The crowd was as stunned as thejurors were relieved. The Lovejoy trial had an immense impact on the surrounding community. Everyone had an opinion. Its impact would undoubtedly have been far greater had Lovejoy been acquitted by thejury instead of the judge. But even at that the trial hammered into the mind of the Connecticut Valley the twin issues of civil disobedience and nuclear power. And new developments were not long in coming. Three days before Lovejoy's acquittal, the AEC ordered twenty one of America's fifty active nuclear plants shut for an emergency safety check. A reactor at Zion, Illinois, had sprung a leak in a cooling pipe, and a check of a similar reactor revealed a similar crack. The other nineteen reactors of that type-all made by General Electric - were ordered to close within sixty days. Six more were shut in Japan. It was the largest multiple shutdown in the history of atomic power. That same day Carl Hocevar, a leading computer analyst at an Idaho company doing testing on reactor safety, quit his position in protest. The true dangers of nuclear power were being covered up, he said, and he wanted to be free to tell the truth. He then joined the Union of Concerned Scientists in Cambridge, Massachusetts. One day after Lovejoy's acquittal, Northeast Utilities announced that the Montague project would be postponed for at least one year. The reason: money. Company officials had begun harboring doubts about a capital investment of $ 1.5 billion, only a third of which they can count on. In August, I974, NU President Lelan Sillin admitted "the company must raise $ 1 billion to build the Montague plant, and when $ 1 billion is needed, and when interest rates are as high as they are, we have to look seriously at the situation." For nuclear opponents, the delay looked like a big step down the road to cancellation. Given the current rate of inflation, even one year's delay could put the plant cost up to $2 billion. Within the past year  at least thirty projected nuclear plants have been postponed or canceled because of the money squeeze, and there seemed no reason why Montague should be an exception. But despite its problems, NU had taken great pains to make clear that the project has not been canceled, and that political opposition will make "no difference" to its plans. Charles Bragg, NU vice-president for public relations, told the Greenfield Recorder at the very outset that local opposition "wouldn't affect us. We would have to go ahead with it even if there was a protest movement mounted by the citizens of the area." It soon became evident that ramming the Montague nuclear power plant into the Connecticut Valley might not be all that simple. In November, 1974, three weeks after Lovejoy's acquittal, the referendum against the Montague plant failed by the slim margin of 52.5 percent to 47.5 percent. Nearly 23,000 of roughly 48,000 voters in the Franklin-Hampshire-Hampden Counties state Senate District registered clear opposition to the project, despite relatively little exposure to the issue. No candidate running for any public office in the region openly supported the initiative. Most of the local press expressed shock. The Greenfield Recorder columnist who had likened Lovejoy to Adolph Hitler now conceded that support for the project was "melting away." The best indicator was Montague itself. In the spring of 1974 the community voted for the plant by nearly three to one. Six months later the ratio fell to less than two to one, with the anitnuclear vote swelling from 770 to 1091- a jump of better than forty percent. The proposition asking for the dismantling of the Vermont Yankee and Yankee Rowe plants also failed to get a majority, but did far better than expected. Some of the candidates and most of the press viewed the proposal as an irresponsible joke at public expense, and predicted it would get 20 percent of the vote at best. Instead 15,313 people - 33 percent of the voters - registered a desire to bury two active reactors valued at approximately $ 1 billion. Wendell, on Montague's northeast border, became the first town in America to produce a majority vote for dismantling, by 98-68.